A bird's-eye view watercolor sketch of Chicago and environs by Edward H. Bennett. 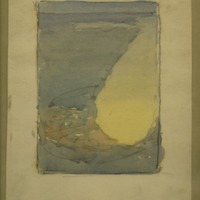 This is one of two such sketches found on a few pages of a scrapbook, retained by Bennett in 1953 when he donated much of his material to the Art Institute. Also located nearby in this removed section of a scrapbook is the image of Burnham writing at the work table in the Plan studio (perhaps but otherwise unprovable that DHB was caught in the act of drafting the text of the Plan). The organizing principle of these retained images seems to be personal mementoes of creating the Plan. Thus, it appears to be one of two sketches perhaps shown to project artist Jules Guerin as guidance to him for his rendering of a bird's-eye view of Chicago's reach up the lake, etc. to appear as the frontispiece (opposite the title-page) for the 1909 Plan. Bennett, Edward H. (Edward Herbert), 1874-1954 , “Edward Bennett's second watercolor sketch for frontispiece for 1909 Plan of Chicago ,” Digital Collections - Lake Forest College, accessed April 26, 2019, http://collections.lakeforest.edu/items/show/2090.